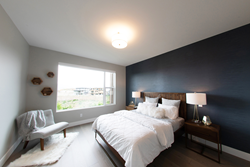 Kestrel Ridge, a new luxury development by the Rykon Group, partners with Haven Mattress Company to create a Sleep Experience Centre in its new Upper Mission show home. Visitors to the Kestrel Ridge show home now have the opportunity to experience Haven's mattresses. Local Kelowna business, Haven Mattress Company, opens the first of many Haven Experience Centres in the newly built Kestrel Ridge show home. Luxury abounds at Kestrel Ridge, a new Upper Mission development featuring 57 uniquely positioned low-maintenance homes catered to the move-down buyer, as local Kelowna business Haven Mattress Company opens the first of many Haven Experience Centres in the newly built Kestrel Ridge show home. The Kestrel Ridge show home is located at 5422 Upper Mission Drive and is open daily from 12PM to 4PM, allowing customers to experience a low pressure, in-person shopping experience without the high markup costs associated with visiting a traditional retail store. Haven's signature products are staged in a beautifully designed, luxury show-home setting, but are available exclusively through their online store. "We think it's a brilliant collaboration," says Scott Amis, CEO of Haven Mattress Company. "Haven customers want to see and touch the product in a natural sleeping setting. The team at Rykon have built a beautiful location to showcase all that the Okanagan has to offer. New neighborhoods like this are hard to find, so attracting visitors for both businesses is mutually beneficial." Adrian Block, President and Founder of The Rykon Group, is in complete agreeance. "We think it's great that local entrepreneurs are competing in larger North American markets," says Block. "Haven has a great product, and the company is growing at breakneck speed. We are happy to showcase these products to the local market here at Kestrel Ridge." Haven Mattress Company is disrupting traditional mattress sales by producing made-in-Canada memory foam mattresses that are sold online directly to consumers. As Canada's first mattress company to use plant-based memory foams to promote a more natural sleep, Haven's luxury mattresses are an economical sleep option for eco-friendly Canadians. Along with the convenience of free door-to-door shipping, all Haven mattresses come with a risk-free 100-day sleep trial. For more information about the new Haven Sleep Experience Centre or the Kestrel Ridge development in Upper Mission, Kelowna, contact the sales centre at (877) 620 - 3525. The Kestrel Ridge development encompasses 57 paired contemporary homes in Kelowna's Upper Mission neighborhood and offers main level and low maintenance living coupled with sweeping lake and city views. Rykon Construction Management is a preferred builder and one of the most recognized names in custom home building in the Okanagan. Here is our team in Moncton, New Brunswick rolling out a fresh-made Haven 10" Rejuvenate mattress. Now zoned with supportive plant-based memory foams. Sleep well knowing that you found an amazing made-in-Canada product that was convenient to buy and set up.